Admin can track the status of orders followed as: New, Confirmed, Order, Picked up, Delivered, Denied and Cancelled. 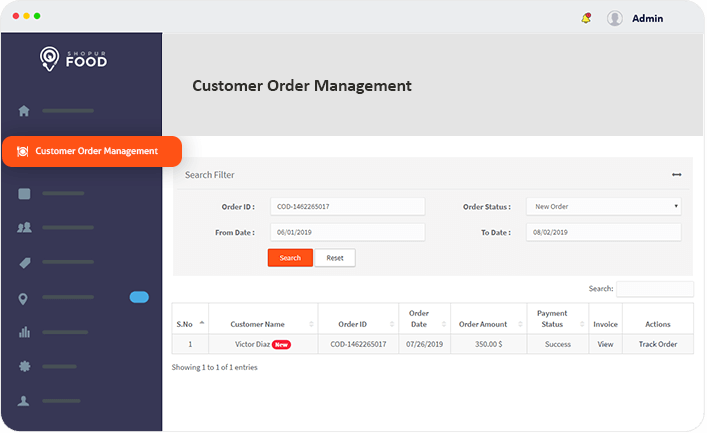 Admin can manually search order by entering order id. Dedicated admin dashboard for managing entire food ordering platform operations. Admin can view, add or edit merchant with unique or common commission settings. Admin can view, add or edit restaurants. Admin can view individual earnings of restaurant’s merchant. 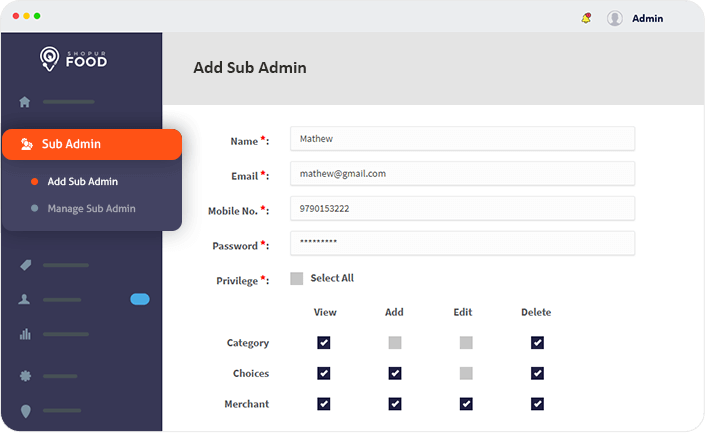 Admin can add or delete and track of user details in the food ordering platform. Admin can do promotional activities such as sending email newsletter to by using user details. Admin can define multiple categories for restaurant item listings. User can filter the restaurants based on the listed categories. Admin can create sub admins to handle delivery. Admin can restrict access to different modules for sub admins in admin panel. User can pay in their convenient payment modes such as Stripe,PayPal,COD options set by admin. Admin / Merchant can give specific discount value offers for food orders to customers.